Francotyp-Postalia Austria is a whollly-owned subsidiary of the Francotyp-Postalia AG in Berlin. 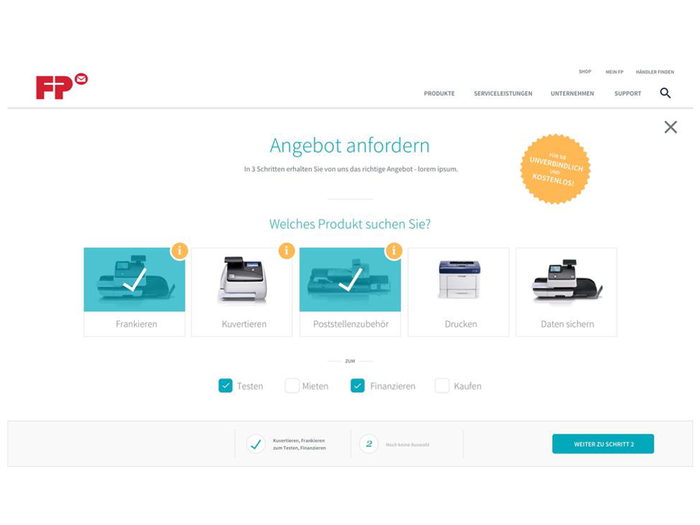 The company has a market share of almost 50 percent of the postage meter market in Austria and is therefore the market leader in this segment. The primary activity of Francotyp-Postalia is the sale and service of postage meters and enveloping machines as well as devices for postage handling both direct sales and service as well as in cooperation with regional trading and service partners. Infopark assisted Francotyp-Postalia Austria in implementing the country-specific website www.fp-francotyp.at. On the basis of the powerful Cloud CMS Scrivito content management system, and with seamless CMS connection, the new website provides the perfect platform for a successful B2B marketing. The Cloud CMS Scrivito, integrated with the Infopark WebCRM JustRelate makes creating convincing mailings and landing pages easy. Mailings can be compiled and managed directly from the CRM user surface. Simultaneously, the Infopark Team included external services like live chats and web analysis tools in the websites so that Francotyp-Postalia Austria can offer their customers a personal, fast and targeted service. The Infopark Team used an agile project management to smoothly develop the launch. The website design was compiled and realized in Cloud CMS Scrivito, existing content data were migrated into the new CMS. The optimal tuning of the CMS and CRM systems allowed Francotyp-Postalia Austria a personalized digital marketing with customer-relevant content. The marketing staff at Francotyp-Postalia can use flexibly configurable forms that can be integrated easily in the Scrivito widget concept landing pages. The cloud architecture also allows the infrastructure of the entire website and its sub-sites to be automatically scaled, depending on need, at the click of a button. Following this successful project, Infopark helped other country to launch websites for companies in the Francotyp-Postalia Group.